Get your own copy of Sign Painters on DVD! Includes Over 30 minutes of bonus material. Give a shout out to your local sign painters with this new, limited-edition t-shirt, hand designed by Bob Behounek. Don't miss out - there are only 130 in stock, so get yours today! While supplies last, get the limited edition Sign Painters DVD and tShirt for a special reduced price! While supplies last, get the limited edition T-Shirt PLUS the limited edition letterpress DVD PLUS Sign Painters the book for a special reduced price! 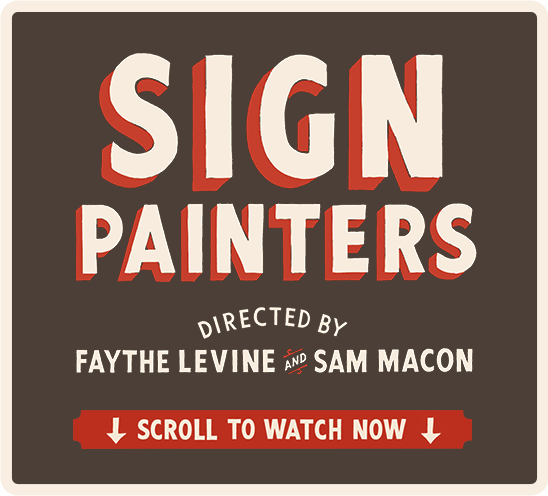 Get FOUR copies of Sign Painters on DVD for a special reduced price! anecdotal accounts from artists across the country including Ira Coyne, Bob Dewhurst, Keith Knecht, Norma Jeane Maloney and Stephen Powers. These vanguards of unseen originality are leading a renaissance with a keen creative purpose and exemplify the working class American success story. Sign Painters celebrates those keeping the tradition intact with a bespoke approach and appreciation for a balance between art and commerce. Faythe Levine works as a independent researcher, artist, photographer, filmmaker and curator. Her work focuses on themes of community, creativity, awareness, process, empowerment and documentation. Levine’s first film and book, Handmade Nation: The Rise of DIY, Art, Craft, and Design was published by Princeton Architectural Press. She is currently working on her third book about a pioneer show-woman, Mimi Garneau. Sign Painters, the book, was published by Princeton Architectural Press in November 2012 features a foreword by legendary artist (and former sign painter) Ed Ruscha. Order your copy today! “Sign Painters, which has been put together with equal parts affection and skill by directors Faythe Levine and Sam Macon, is fresh and passionate and unexpected." "A cautionary tale about the head-long rush into a technology-driven time and a meditation on what’s lost along the way. It is a reminder to look around and recognize the physical history in our presence every day."